A fantastic read for anyone seeking a wealth of adventure, wonder, and imagination.. The Empty is a fantastic read for anyone seeking a wealth of adventure, wonder, and imagination. Why? There are many reasons. For starts, there is that refreshing feel when a new series catches me from the beginning. It starts out fairly simply and builds from there. We have an empty desert-like world, and something out there beyond it all; which will eventually connect. 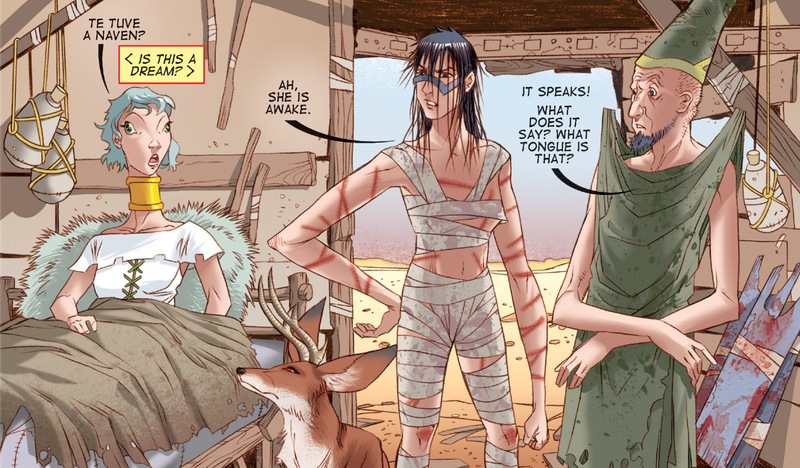 We rely on a bold protagonist (Tanoor) who will defy odds of survival (not in her favor) and rebel against local prejudices, to befriend a mysterious outsider (Lila), as they take on a fantastic journey together. Out in the Empty are new friends and dangers, and answers that will surprise both our protagonists and readers as well. And there is a sense of geography, though we are uncertain of the placement. From the beginning, we know of many benefits and dangers present, as they build a lifestyle and culture for the locals. We learn of the wild and fantastic dangers that feel like something out of an old pulp story, calling for action using what ever means are necessary. This includes the strange use of our heroine’s arm-shield devices, and the mysterious power of her new companion. We get many excited moments, from whatever it takes to survive and keep going.. The characterizations are fantastic. Tanoor remains central to the story, though much of the plot revolves around Lila. We as readers I think can see this Empty world through Tanoor and her tribal ways, or Lila as the stranger. We learn about our characters and various groups they meet, with lots of new creatures and devices through character discussion and discovery, action and progression of the story. Nothing feels shoehorned in, just a nice natural flow through a pacing similar to the Wizard of Oz classic story. Every new friend adds to the story, as together they learn about themselves and the world around. Also, the fantastic theme of friendship and compassion is constant throughout, and shines well in the end of this first volume. Along the way, many strange and wonderful creatures along the barren and otherworldly landscapes. Much of these species revolves around the mysterious roots poisoning the Empty land. There are hints of environmentalism, and the feel that something unnatural is at work which is slowly revealed to the readers. The answer is compelling, and thought-provoking. The art is fantastic, and feels unique to the overall setting. We get much of the story in two worlds. One is the Empty, a desert hot dry climate where options for survival are limited. Yet, the art makes it beautiful and dreamlike. The Empty is a place worth traveling through, as we know there is something waiting out in the beyond. That would be the other world, a world of farming and lush greenery which acts as a side story that will eventually converge. At a glance, one may question the anatomy of the artist. Some may rush to prejudgment. But reading through, you learn such style has narrative purpose. The world is unusual, and so are its inhabitants. The Empty’s tribal inhabitants have longer arms, while Lila’s race have long necks and big eyes. It’s beautiful how creator Jimmie Robinson presents the two, as something normal but on how the meeting of racial and cultural differences can be wonderful, should the right connections follow through. There are other subtle differences between the two races that deepen the story. Many of which, the reader will learn. Along the way are other subtle messages on familiar topics. Some of included but limited to environmentalism, government corruption, value differences, and new discoveries challenging old beliefs. The sequential form is traditional, with nothing fancy in panel transitions. Yet, the pacing and visuals through panels are fantastic and flows through like an animated movie. When action happens, we get some cool shots and exciting angles. When conversation occurs, we get great attention to surrounding elements of nature and dwellings. The colors also fit and aid well to the settings. 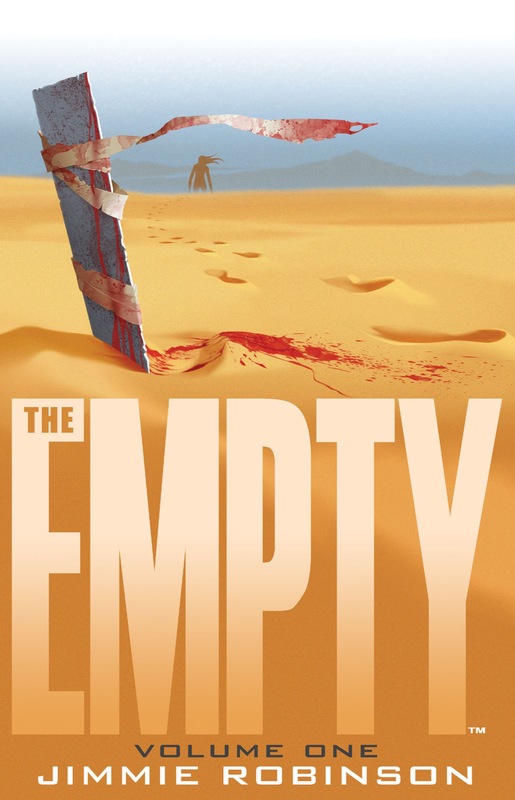 Overall, the Empty is a treat with more than I expected, with the right blend of action, drama, humor and intrigue. But, I hope I didn’t raise your expectations too much. I held back on why this series is fun and thoughtful, with great resistance on spoilers. I think new readers should discover for themselves, the wonderful fullness of The Empty, Volume 1!